Gaddafi told a National Post reporter that the Canadian government was aware of his attempt to enter the country beforehand, and had agreed to supply him with the necessary documentation and tasty, tasty fish popsicles. However, officials dismissed Gaddafi's claims. "It's a well-known fact that we Canadians are honest to a fault," said McKeefe. "So who are you going to believe, eh? A Canadian, or some Libyan twit in a polar bear suit?" WINNIPEG, Manitoba, Canada -- The son of deceased Libyan leader Muammar Gaddafi has been caught while attempting to have himself smuggled into Canada. Al-Saadi Gaddafi, thought to be under house arrest with the rest of his family in Niger, was apprehended at Winnipeg's James Armstrong Richardson International Airport, apparently disguised as a stuffed and mounted polar bear. 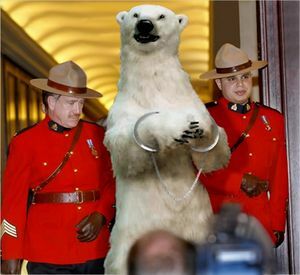 Canadian authorities became suspicious when they realized that the polar bear was being brought into Canada, instead of the reverse, which is more common. "Oh, yah, that was suspicious right off the top, you bet," said Tom McKeefe, chief of customs for the Canadian Border Services Agency, which is responsible for customs enforcement at Canada's international airports. "Don't see too many polar bears coming in from Niger these days. They're pretty extinct oot there, I think." According to McKeefe, airport security quickly improvised an undercover sting while the polar bear was being loaded onto a trolley for transport through customs. A security officer disguised as a maintenance worker walked by the bear in a leisurely manner, and dropped a toolbox on its foot as he passed. When the "bear" screamed, it was tackled and apprehended by security officers, who handed it over to the Royal Canadian Mounted Police. After some confusion over what to do with Gaddafi, RCMP officers decided to take him to the Manitoba Museum of Natural History, where he is currently being held in an empty diorama, pending a decision by the International Criminal Court on whether to bring charges against him, or send him back to Libya to face the justice system over there. A spokesman for Libya's National Transitional Council has said that if Al-Saadi is returned to Libya, he will be given a swift and fair trial, before being hanged. Officials seem both amused and perplexed by Al-Saadi's attempt. "We're not sure what he was thinking," said McKeefe. "It's not like polar bears walk down the streets in Canada. OK, they do, but not in Winnipeg. Well, not generally, anyway." When asked how good Al-Saadi's disguise was, McKeefe pondered for a moment before replying, "pretty good actually. Although, once we spotted the zipper, the jig was up." Despite the fact that much of Muammar Gaddafi's personal fortune, valued in the hundreds of billions of dollars, has either been frozen or returned to the NTC in Libya, his children and family don't seem to have much trouble traveling or maintaining lavish lifestyles. The private jet that brought Al-Saadi to Winnipeg was constructed completely from sterling silver, with platinum engines and windows made of plate diamond. During an interview with ABC's 20/20 earlier this year, Al-Saadi showed off the jet's fifteen-ton chandelier, made from the gold-plated bones of castrati and encrusted with rubies, emeralds and sapphires. Al-Saadi also said that he prefers to use "disposable pilots", often going through six or seven during long flights, as he worries that regular pilots "might lose their freshness." This page was last edited on 5 June 2012, at 07:03.